The Larson Electronics SPDL-LEDDB-5-SGC Solar LED Strobing Dock Light is powered from internal lithium ion batteries that are replenished by a solar charging panel or cigarette plug charger. The beacon is equipped with a permanent mount bracket that is designed to clamp against existing signs. The amber color light output ships with a clear lens and an orange base while all other color options ship with a clear lens and a black base. The SPDL-LEDDB-5-SGC features a non-metallic housing for a high degree of corrosion resistance which is an important feature to consider for a marine location dock light. This solar powered LED strobing beacon is ideal for marine applications and is able to stand up to harsh conditions while resisting corrosion. This compact rechargeable LED solar strobing dock light contains an LED diode assembly that produces 360° of brilliant light. The effective distance of this LED strobing dock light is approximately 1000 feet. While we offer much brighter LED strobing beacons, our design goal here was to produce a beacon with reasonable light output that could run 24 hours a day, seven days a week with 5 hours of daily sunlight. Thus we choose a 1 watt LED and sized the lithium ion batteries and solar panel to produce and store enough energy to power the beacon. Keeping in mind that this LED beacon may not be exposed to sunlight continuously, we built in a 12 volt vehicle charger option as well. The vehicle charger will bring the beacon to full charge in 2 hours. The SPDL-LEDDB-5-SGC offers reliable, all-night operation for a constant source of light in marine applications, such as on docks and marinas, where reliable lighting is vital for safety and visibility. 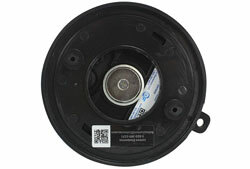 This LED strobe light includes a permanent mounting bracket system with through holes for the mounting base. The L-shaped bracket is designed to be mounted on existing signs up to 0.08" thick, to add a higher degree of visibility for important information or warnings on signs. Once attached, the beacon can still be removed by twisting the beacon counter-clockwise off the base. 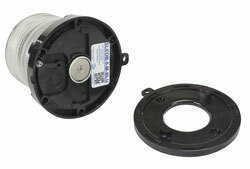 This twist lock design allows operators to remove the light for vehicle charging if necessary. For example, if it is mounted on a sign that is located in a shady area or under an overhang or building, the sunlight may be insufficient to recharge the beacon and vehicle charging may be required. However, if the strobe is mounted to a sign that is exposed to the sun daily, operators can add an additional screw that locks out the twist lock function. This simple yet secure mounting system saves operators the hassle and cost of more complicated marine application lighting solutions. 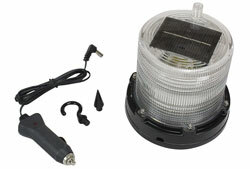 This solar powered LED beacon is both weatherproof and shock resistant which are both ideal features of a dock light to be used in marine applications where weather, water and other rough treatment can be expected. This strobing LED dock light assembly is protected by a polycarbonate lens cover that is designed to efficiently distribute the flash over a 360 degree radius. The color of this unit is produced by color specific LEDs rather than a colored lens. This increases the effectiveness and reliability of the unit as there is no chance of lens discoloration and no loss of output due to diminished optical clarity. Both of those things mean that the SPDL-LEDDB-5-SGC is an ideal beacon for adding increased visibility to warning signs including those found in harsh, marine locations such as on a dock. Suggested Applications: Existing signs, dock lighting, marinas, boat houses, channel markers, mooring lights, safety lighting, buoys and any other marine applications that require a constant source of strobing colored light as an indicator, signal or safety light or applications where higher visibility for an existing sign or signs is required. 8. Mounting bracket is designed to clamp onto existing signs.